These stylish drop earrings feature a glittering cubic zirconia, nestled in a twisted band of 9ct rose gold. Simple elegance for all occasions. 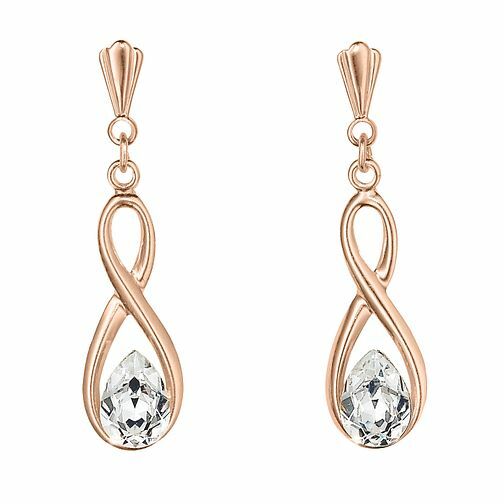 9ct Rose Gold Cubic Zirconia Figure of 8 Drop Earrings is rated 3.8 out of 5 by 6. Rated 5 out of 5 by Anonymous from 9ct rose gold earrings Bought these for my wife's Birthday /retirement present, she was greatly surprised on receiving these. Great quality and we'll manufactured, would highly recommend these and would buy again. Very prompt delivery and packaged well. Rated 1 out of 5 by Anonymous from not the best tells you if you burst seal to package they are none returnable ,,, but you don't know if they are suitable unless you take them from the packet ,,, the butterfly at the back is so fine and small you would need baby fingers to be able to handle and put on earing ,,, now I have paid for a pair of earings that are totally no good to man nor beast ,, and money wasted that I cant afford to waste ,,, not happy ate all !!!!!!!! !